I thought I was going to make green beans with the shrimp but the beans did not make the trip in the cooler to Utah well. So what to do? I have some fresh broccolini and celery as well as corn in the freezer. Succotash? I don’t like succotash because usually it has lima beans in it. I find their texture mealy. I decide to cut off part of the broccolini stems and combine that with celery, onions and garlic along with the corn. Success! I steam the potatoes and John sautes the shrimp. The dinner takes about 1/2 hour to make. The sweetness of the corn goes well with the shrimp. The potatoes pop with a little butter, salt, and parsley. This is a good dinner and quick and easy to make. 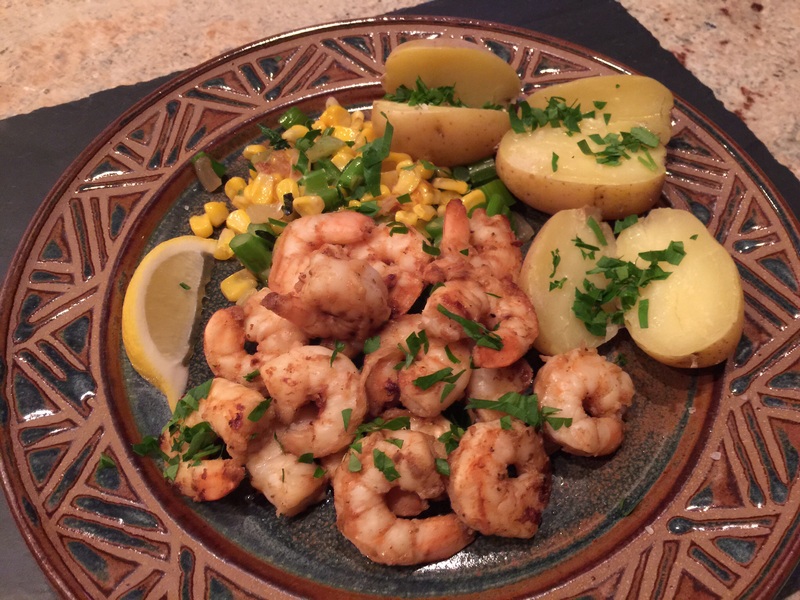 This entry was posted in Shellfish and tagged broccolini, corn, new potatoes, potatoes, Shellfish, shrimp, succotash. Bookmark the permalink.